One of the accessories that you will need in the making of your zip wire run if making it by using individual components, is a galvanised thimble eye. 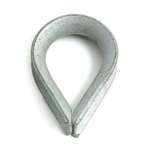 Simply and easy to use, a galvanised thimble eye has been designed to act as a reinforcement for your zip wire cable. 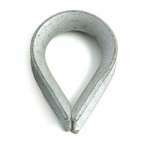 Simply loop the cable around the outer groove and secure with wire rope grips.